1952 Chevrolet Bel Air Deluxe 2 Door Hardtop. Just like the one I had in high school except without the Corvette motor or the rust....... Fresh from the Tucson Desert where it has spent it’s entire life. This is the best original Early Chevrolet hardtop that I have seen in quite some time. It was sporting all of it’s original interior, tattered as it was, and the jambs and trunk are still original paint, which was Regal maroon with an onyx black top. 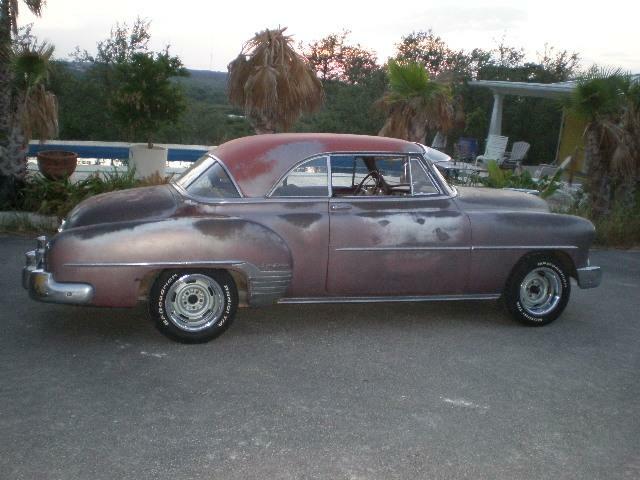 It has had one repaint long long ago in what appears to be 57 Belair Dusk Pearl. It has worn down to a very nice patina. I like it just the way it is and I probably wouldn’t paint it, after all, I never got around to painting the one I had in high school. I was rat rodding before rat rodding was cool.......not that I wanted to be a rat rodder, I just couldn’t afford gas, beer, And paint, something had to give. This car runs and drives like a new 52 Chevy. Everything underneath is very clean as is typical for a desert car. It has fender skirts,the original wheels with nicely faded original paint and pinstriping, hubcaps, and trim rings with wide whitewalls, I am just not a fenderskirt/wide whitewall kinda guy so I have put a set of Corvette Rally Wheels on it with new T/A radials. These early Hardtops are getting quite hard to find in this condition. I’m afraid it really wants to hook up with that 59 283 powerpack motor and T-10 4 Speed over in the corner of the shop...... I just have a very hard time bringing myself to modify a car that has stayed intact for 59 years.. But that would more than double the horsepower.....Hmmmm..... Well, it has been my daily driver now for the last few months and I love this car. Update; The complete original drivetrain has been replaced with an L-98 Corvette motor, an old school 4 speed overdrive, and a 57 Ford 9 inch rearend, pwer disk brakes, etc. The price on this old girl is going up. It runs and drives like a million bucks now, and it would take a lot of typing to explain everything that has been done in the process..... Wow, This old girl is really fun now. Any guilt I felt about changing out that original drivetrain quickly dissapeared with the first testdrive. It now has a new yellow and black 57 Belair style interior that is very top notch, so the price went up again.